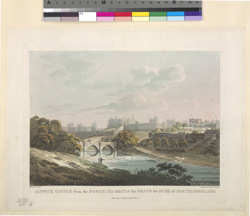 North view of Alnwick Castle, approached by crossing the River Aln. Originally a simple motte-and-bailey castle, it was rebuilt in stone in the 12th century. Acquired by Henry Percy in 1309, the Percy family were responsible for maintaining and developing the castle. The castle was subject to intense restoration work in the 18th century, and famous landscape gardener Lancelot 'Capability' Brown was employed to rework the grounds, which covered an area of approximately seven acres.